A lot of the time my thoughts are filled with cats, cats and more cats but sometimes I do wonder about beauty products. Being a beauty blogger, they do cross my mind from time to time y'know. I often think to myself, "Why hasn't someone invented ____ before?" and I've realised this thought occurs quite a lot. Then I thought I should probably write these products down and here I am, pitching them to you Dragon's Den style! Well not really, but here are the beauty products I wish existed and am quite frankly baffled why they don't. I'm pale and I like to embrace that. Fake tan has never really appealed to me - it seems like a lot of hassle and the streaks and patchiness have always put me off. Not to mention the fact that any kind of orange would look odd next to my ghostly face so I just never bothered. I dabbled with Sally Hansen's Airbrush legs for a bit but really that was only because I wanted an even skin tone for my legs, not to add any colour. My idea is fake pale. It does what it says on the tin, evens out your paleness and calms down any redness you may have. I know I have. It's a bit annoying there's no such thing for us Casper's but fingers crossed some genius will invent it for us soon! I did a bit of research to see if these were available. Apparently Sephora did them but I can't find them, only a bunch of bad reviews so I'm guessing they got discontinued. I curl my top lashes everyday - it's gotten to the point it feels wrong if I ever forget to - and can't help but wonder if curling my bottom lashes would make a difference. Bottom lash curlers aren't a product I need, but they are one I'd be damn curious to try, wouldn't you? Glasses wearers will know my problem when I say 'glasses marks'. It wouldn't be so much of a problem if I was wearing my glasses all day but I only need them for seeing in the distance. When I take them off, I'm left with two marks near my nose where my foundation has rubbed off as a result of my glasses sitting on them! It's the same with sunglasses, I've been that person on a few occassions where I don't take them off indoors and you know why? Because of the glasses marks! Beauty industry, I put it to you, please make a foundation that is resistant to such marks and for the sake of human kind, make it affordable. Phew, I feel like I've just got a lot off my chest. I'm sure if I put my mind to it could think of more but I'll just leave it at three for now. Are there any other 'things I wish existed' posts you'd like to see? Clothing items, everyday things, gadgets? I could get to thinking and make this a series! 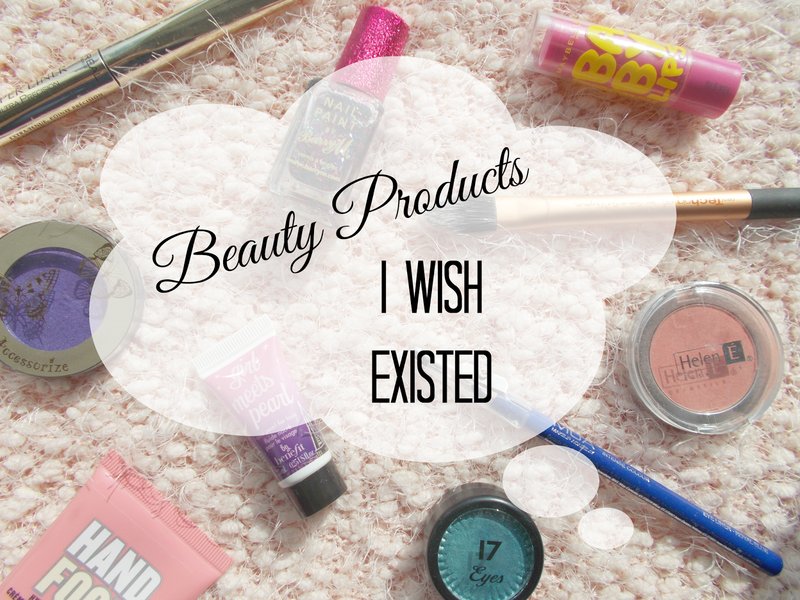 Can you think of any beauty products you wish existed? What a week - the UK nearly lost Scotland! I'm not Scottish nor am I politically minded but I think it's a good thing the majority voted 'no'. No matter what outcome you would've preferred, I think it's really cool that we got to live through this important moment in history. It's the kind of thing my children will ask me about when I'm older, and that to me is exciting.
. . . 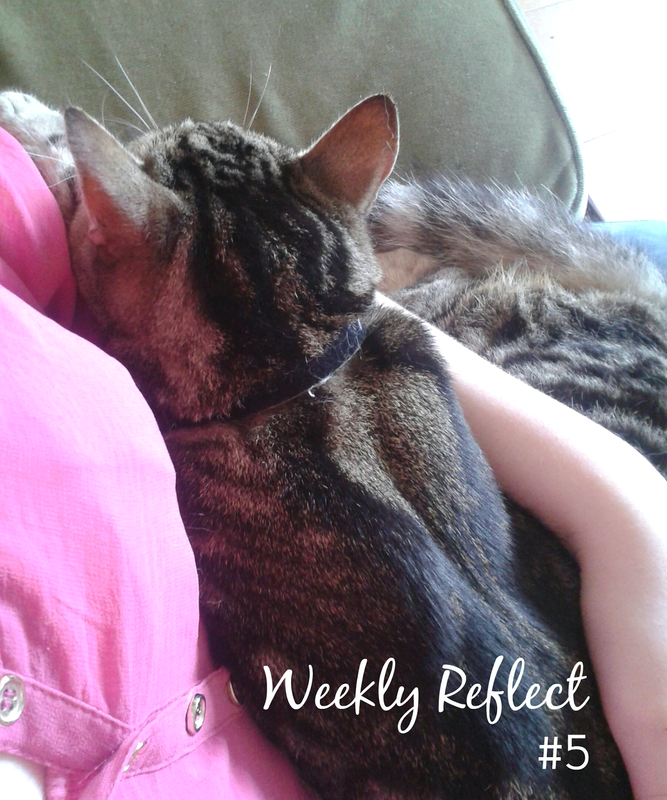 I'm back in the swing of things regarding school work again and the homework is gradually building up. I know I'll probably miss school when I leave at the end of this year but right now I can't wait to!
. . . Very sadly, a teacher in my school passed away this week as well as a boy in my class' dad. You could feel everybody's mood was down throughout the week and I went to the funeral which was really emotional. 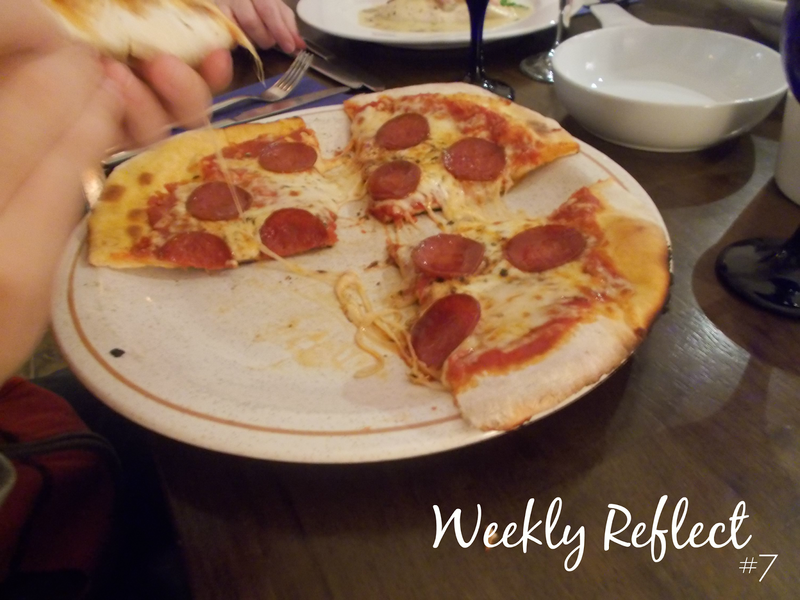 I found Lily's post on coping with death extremely thought-provoking and poignant this week.
. . . On a lighter note, we went out for dinner last night to wish my sister farewell as she's left to go back to uni again today. I had biancaneve pizza then peach melba three ways for dessert, both of which were absolutely delicious. I will of course miss my sister when she's away, but getting the bedroom we share all to myself is a benefit!
. . . Something lovely about this week was the collaging I did in art. We have to make a notebook and I had a great time filling in my background with different magazine ripped images. I also went into The Works and picked up some crafty bits and bobs to add to it. 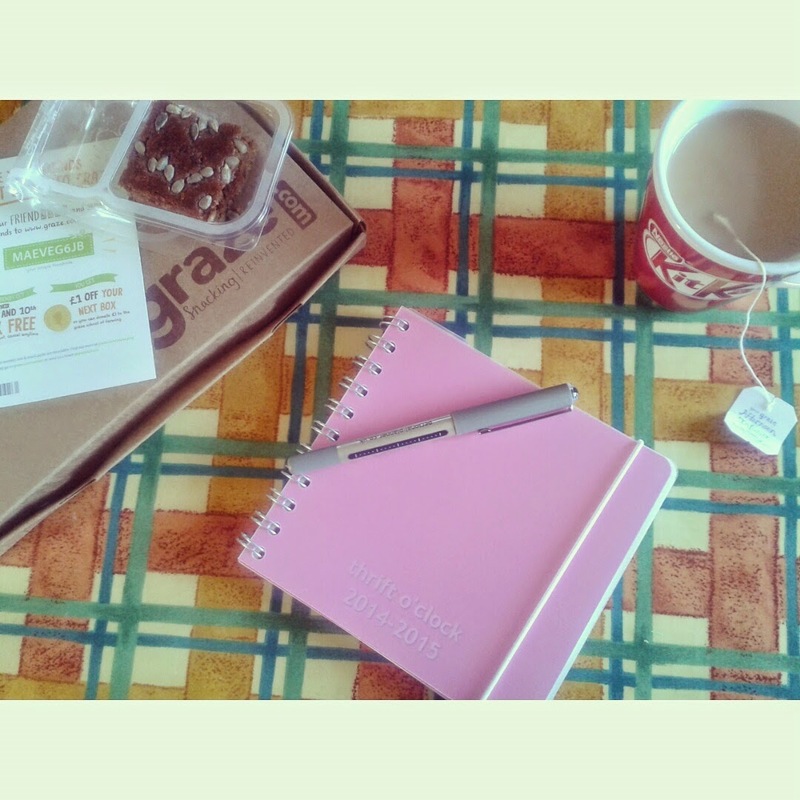 Notebooking is such a nice way to spend time getting creative! So that was how my last seven days panned out! 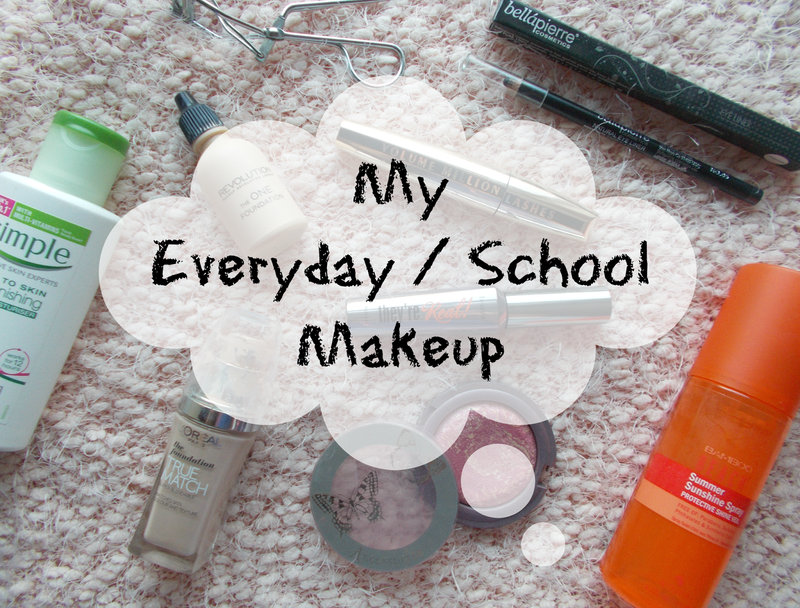 I've recently started back at sixth form and I thought it might be interesting to show you the makeup I wear to school on a daily basis. It's very simple and natural as my school has strict makeup rules and doesn't allow anything other than a light foundation. I don't like to go too heavy with my makeup anyway so this look isn't too dissimilar to what I'd wear on the weekend if I was going out during the day. For my base it's all about a natural and dewy finish, so I take L'Oreal True Match foundation with a smidgen of Simple moisturiser and mix those on the back of my hand, then buff that onto my face. My weapon of choice is the Real Techniques Buffing brush. It's a great size and shape for applying foundation but in the past I've used it as a powder brush so it's a definite multitasker! For days when I want an even lighter base, I'll go for Makeup Revolution's The One foundation which I reviewed in detail here! Then when I'm happy with that, I move onto my eyes. Curling my lashes has become an essential part of my routine followed by tightlining my upper lashes. I was recently sent the Bellapierre eyeliner pencil in charcoal to try out. Now, I usually like my liners to be soft and blendable but this is not. It's not the best for smudging because it's quite firm, but that actually makes it a fantastic tightlining pencil because it doesn't budge or transfer onto the waterline at all! Tightlining takes a bit of practice but now it's a step I would struggle to leave out! For my lashes, the bigger the better. This is where I break the rules a bit but I don't care, I won't go without my bold lashes and I use a combination of two mascaras to emphasise them. L'Oreal Volume Million is what I use to get my bottom lashes looking defined and to add colour. Blonde hair problems! 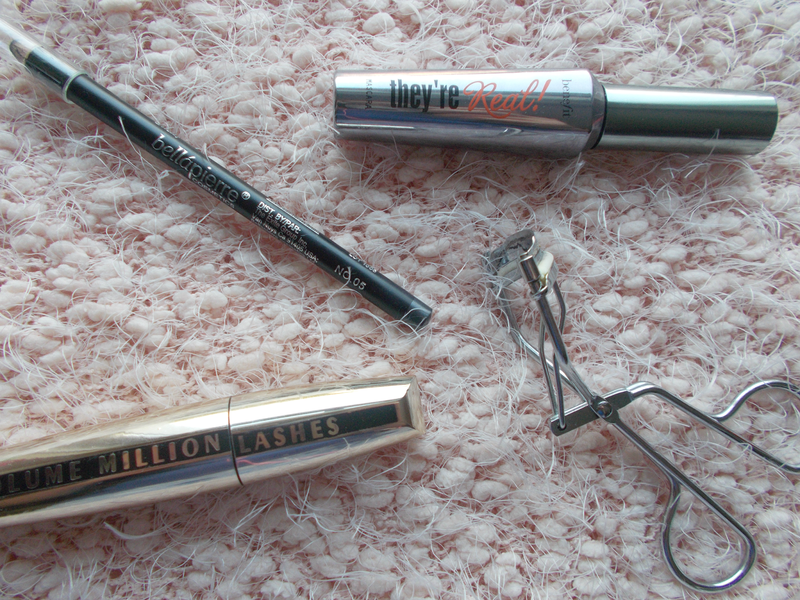 My all time favourite, holy grail, does the whole shebang mascara is Benefit They're Real! as it really does tick all the boxes for me. Volume, length and definition - the only thing is I personally don't love it for my bottom lashes. If they came out with a bottom lash version I'd be in heaven! Moving back to my base, I apply blush, namely an Accessorize one in the shade Scandal. As you can see it's well loved to the point where the lid has broken right off but I still love it. 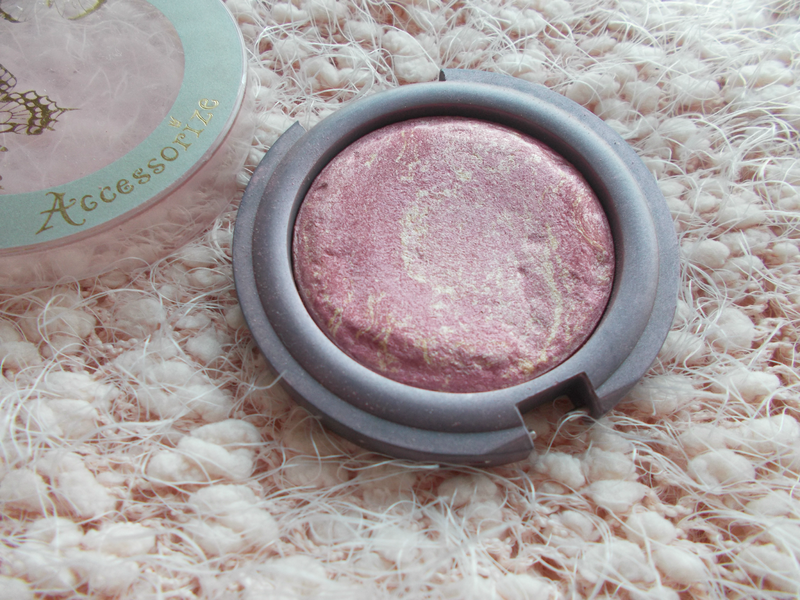 I'm not sure you can get Accessorize makeup anymore, but if you can find it I definitely recommend their blushes. It's got a lovely amount of pigmentation, fairly sheer but definitely there. Scandal has a slight shimmer running through it so it adds a gorgeous natural glow, much like a MAC Mineralize Skin Finish or blush. My preferred blush method is to sculpt it along my cheekbones and blend it out a bit - not the conventional 'apples of the cheeks' way but it's the way that suits my face! I use my Real Techniques Contour brush to do so but I'm on the look out for a new blush brush - angled and a bit bigger than the contour brush so any suggestions are very welcome! By now you might be thinking, "Maeve, what about the brows?" Well let me tell you, the only thing I do to my brows is pluck them into shape and comb them through to keep them tidy. No pencils, no powders, no filling them in - I did tell you I prefer the natural look! I just don't think I'd suit filled in brows, plus it saves me the time in the morning! When it comes to my hair, I don't tend to do much with it for school. I'm not my hair's biggest fan - I think it's just boring and it gets messy within 5 minutes of leaving the house anyway so I rarely do anything other than leave it naturally wavy/curly. I actually made a bit of effort here and straightened it so it wasn't such a mess! I really want to get my hair cut into a nicer style but I just don't know what. It doesn't help that I'm terrified to take the plunge of going to the hairdressers! 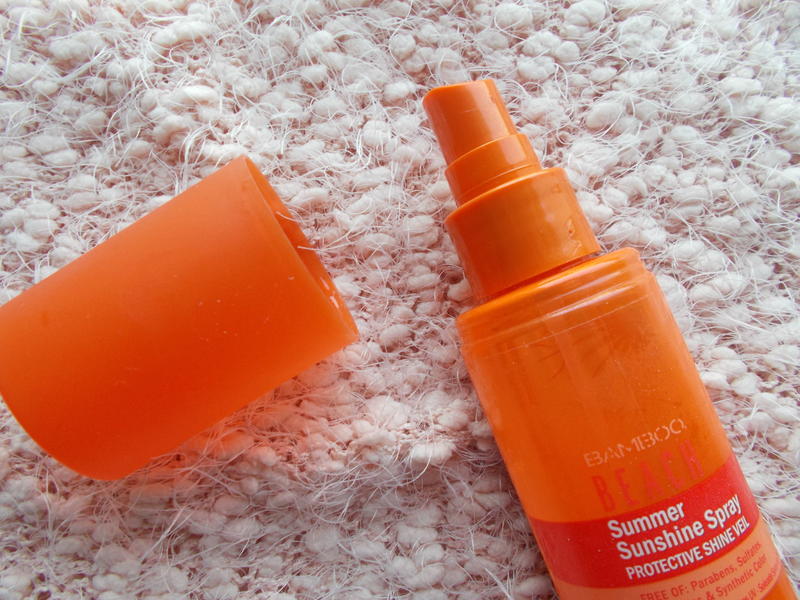 Recently though, I've added a shine spray into my haircare routine, the Alterna Bamboo Beach Summer Sunshine spray and even though it's just one thing, it's made a huge difference to how I feel about my hair! I've gone from having lacklustre locks to at least having a bit of shine. Not to mention how AMAZING this stuff smells. Think the most tropical, fruity, sipping cocktails on an island smell you can imagine and that's just about it. It doesn't make your hair sticky at all, just spritz and brush and you're good to go. My hair is quite long so I need to use quite a lot but if you have a pixie cut this would last you ages! The makeup I wear on a daily basis, in all it's mundane glory for you to hopefully get a few tips and ideas from. Let me know if you use anything similar or have any natural makeup product recommendations for me! If you want to know anything more about the products or techniques, just ask in the comments below! This post contains some products (Makeup Revolution, Bellapierre & Alterna) which were sent to me for reviewing purposes but all opinions are honest and my own. My second week back at school and boy am I missing those lie ins. I'm not even the type to stay in bed after midday, I count 10am starts as lie ins! Getting up at 6am every morning has been a struggle, especially with the ever growing work load from school but besides those things, it's been a good week! cheeky instagram pic of my working elevenses on Friday!
. . . I got my Personal Planner in the post! Don't worry, I'll be giving that bad boy a whole post of it's own soon, plus a cheeky giveaway if you're lucky! I love it, I just know it's gonna come in so handy for blog organisation.
. . . on Thursday, I went to University of Ulster Jordanstown's Open Day. It was basically a day of walking around stalls related to different uni courses, listening to lecturers and students and exploring the campus. I think it looks like a nice university but it just wasn't for me. None of the courses stood out to me and I still don't want to go to uni!
. 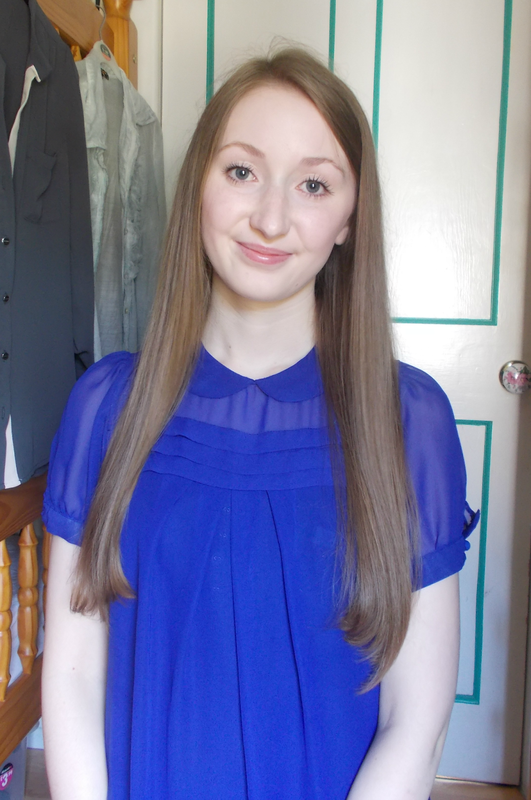 . . on Saturday, I had to do a bit of filming for Media Studies. I had a bit of anxiety getting there and back what with the train and the fact I didn't know the area whatsoever, but it all worked out fine and I'd say it was a pretty successful filming day!
. . . during the week, my Media class and I had a go at making sugar glass for our film and well, let's just say it didn't go so well. We didn't have all the ingredients we needed so we had to improvise a bit. Put that on top of the fact we had no idea what we were doing and it was a recipe for disaster! Might just have to see what ebay has to offer instead . . .
. . . yesterday after filming, I also did a bit of thrifting in my favourite charity shops and found two absolute gems! The first is a long knitted jacket with a pattern made for Autumn/Winter and the second is a stunning white shirt. A few weeks back I picked up some homeware bits in a charity shop so would you like to see a thrift haul, perhaps? As you may know by now, I'm a self-confessed stationery addict. I've alway been someone who collects pretty paper and pens for those 'just in case' moments such as, "What if I want to send a personal thank you letter to someone?" or "I'm sure my auntie would love to hear about my week if it's written on pink floral paper." You know what I mean? There used to be a little craft shop near me where I could stock up on all my crafty goods and I even got friendly with the staff I was in so often! I was gutted when it closed down and I haven't really been able to find a replacement since. Crafty Creatives have come up with a brilliant idea for those of us who still like to send snail mail and get creative - let's talk about their new #paperhaul box. Launching very soon, you will be able to order a limited edition box for £10 a month (which I think sounds pretty reasonable) filled with gorgeous bits and pieces such as washi tape, postcards, greeting cards, stickers and of course, pretty paper. There will be a new theme to the box every month so you can collect a wide variety of stationery and have it delivered to your house! I'm very excited about this indeed, and can't wait to review the box for you right here. I'll be keeping myself posted on all things stationery over on their new Twitter @PaperHaul - go and show them some love, eh? Are you a stationery collector too? Do you actually use it all or are you just a hoarder? What's your favourite thing to collect?